Disclaimer: Except for the cover image, rights of all the other images and gif files are properties of Lijing or other sites which interviewed him. It was a cool, gloomy morning when I arrived in Suzhou to visit the legendary Lijing. I knew about him even before Lin Chiling hosted a feature episode about him, because of how popular he has already been in the Hanfu circle. Naturally, I was filled with curiosity and anticipation especially because our common friend Mengmeng who knew him for almost a decade told me so many other stories of him. For those who are not familiar with who I’m talking about, Lijing is THE most famous Chinese kesi/k’ossu fan maker in whole of China. Fan has been an important accessory in Chinese culture for over 3,000 years, and kesi/k’o-ssu is a special weaving technique that is so exquisite and intricate that only the imperial families had access to them. There was a famous saying that says “an inch of kesi/k’o-ssu is as valuable as an inch of gold”, because it was extremely labour-intensive, and it takes a long time to produce just an inch of the weaved fabric. And the best part is, because of this special weaving technique, both sides of the weave are identical (so there’s no “wrong” side). Kesi/k’o-ssu (缂丝) is also known as pictorial silk tapestry (literally translating to ‘carved silk’), and was the first batch of crafts to be listed under China’s intangible cultural heritage items in 2006 (when they just started taking stock of these), and subsequently in 2009 was mentioned along with other silk crafts as part of UNESCO’s intangible cultural heritage of humanity’s Sericulture and silk craftsmanship of China. The UNESCO video was quite a good summary if you’re interested. This extremely valuable intangible cultural heritage of China, unfortunately, faced its decline as with many traditional crafts. Lijing and his team, however, managed to bring greater awareness and created a financially sustainable market for greater consumption through great design, acute business sense, as well as brilliantly strategic collaborations with celebrities and brands. Lijing, like Warhol, was under no illusion that the commercial world is the only way to go if one wishes to be financially sustainable. And what better ways than to be associated with celebrities and the fashion world! The only difference is, I think that instead of booze, he drank lots of tea instead! Hold my teacup while I name drop the who’s whos. First up, we have Liu Wen, the first Chinese Victoria’s Secret model posing with his fan in an English castle, for the Chinese Bazaar fashion magazine. His fans… are so impeccably beautiful and he’s a great repurposer (he would take antiques and do a fresh spin on them on his fans). Yeap, he actually started out as an antique collector. His items are quite reasonably priced despite his fame because like Warhol, he is the creative director and personality of his brand, and the physical making of items (unless the bespoke pieces) were all done by his staff. This sets him apart from the other traditional craftsmen (like Warhol from other traditional artists of his time) in that he doesn’t actually does the kesi/k’ossu but that he gets the old craftsmen to create works based on his design. This is a contentious point amongst other craftsmen who called him a “mere merchant” but hey, we are still celebrating Warhol’s work decades on right! It definitely brings a totally different paradigm of understanding in what constitutes an artist’s mark, or in Lijing’s case, a traditional craftsperson’s mark of authorship. I prepared a bunch of questions, and it’s enlightening to see how he responded to them. Definitely got up close and personal to understanding him as a person, beyond all his fanfares (pun intended). I’ve consolidated and loosely translated them into English for all to access below, and will be adding some observations and remarks at the end. Have you always been interested in design? What brought you to what you are doing today? I did Business Administration in my bachelors’ and then went on to do a Masters in Arts and Design. My basic education did not have much to do with what I’m doing now, I did my Masters because the opportunity presented itself. I didn’t really want to start working after my bachelors, so I decided to do a masters. I figured I have some background in painting and drawing, I’m alright with memorising content and rote learning, and no problem with theoretical content, etc. It wasn’t such a conscious decision to go into this line of work. Things just happened. I read from other interviews that you love Chinese opera, so when did this interest come about? I first saw it on TV when I was in high school, and got curious. Growing up, we’ve always been taught that Chinese Opera is the essence of Chinese culture, but it’s only through the TV that I first got interested in it. And for me to do what I am doing today, fans and all, Chinese opera was the main reason that brought me to where I am today. 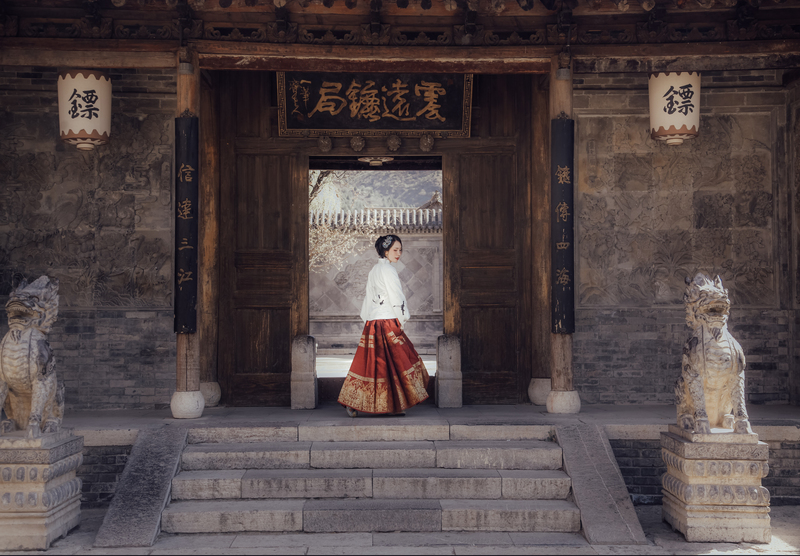 There are so many different types of embroideries, crafts, and aesthetics that are manifested in Chinese opera costumes, props, and performances, and when you get into it, you really saw a whole world of Chinese culture, so although fans are not a major prop in Chinese operas, it opened doors to understanding different traditional Chinese crafts. So what got you interested in fans, in particular? It’s just another coincidence as well. I collect many antiques, so initially, I collected many foldable fans, and then came those round fans. Some of them would have certain wear and tear, in which case I would need to find craftsmen to repair them, but couldn’t find anyone to do that. So I just tried to repair them myself. Bit by bit, it became a part of me. As I work more on it, I uncovered more details and nuances about fan making, and it’s not a repetitive task because you always make something new and different as there are so many variables and you have to exercise a lot of creativity in the process. How are the youths or younger people taking to these traditional crafts? You mentioned in your other interviews that you wish for these to be more accessible, and how has that been working out for you? In the last few years, there has been a lot of media exposure and public awareness of our traditional crafts, so the situation has really improved. What we have been doing is to have a wide price range for the fans that we make. We have simple fans ranging from a couple of thousand bucks onwards, so it’s not too out of reach for people. And we wanted to make people relook at Chinese aesthetics, not as an outdated, passe and kitschy kind of aesthetics. Have you thought of making your items overseas? Not at this point! The Chinese market is already big enough, and it is much easier to explain and educate the Chinese about our own culture and aesthetics because we grew up with it, than to educate the foreigners to appreciate and understand the Chinese aesthetics. As such, it’s harder to convince them to spend on these items at this cost. People have always looked up to Japanese craftsmanship as the ultimate gold standard, but not so much awareness of the Chinese ones, why do you think that’s the case? I actually disagree with this observation. There is quite a lot of interest and high regard for Chinese craftsmanship as well amongst many, especially the seasoned Chinese collectors in the inner circle. And although I myself really like Japanese craftsmanship and items as well, it’s fundamentally quite different from the Chinese psyche and aesthetics. A couple of decades ago, the Japanese craftsmen were really of very high quality (not so sure about the situation now), and extremely precise and its quality is something that visually you can identify as being high quality (i.e. you can see that the surface is smooth and flawless, the mother of pearl is very orderly laid out, so regardless of cultural background people would find beauty in its regularity and details). And the Japanese government and society have also been reviving their traditional crafts for far longer than the Chinese. It’s only in the recent few decades that the Chinese started to revive our traditional crafts. When it comes to Chinese crafts’ aesthetics, it comes from the literati and imperial’s point of appreciation which isn’t that apparent to the eye, or not that universal. It actually requires a huge amount of cultural capital/understanding and sophistication before one can appreciate certain essence of that piece of craft/art. Both cultures have their strengths and areas for improvement. In Japanese culture, craftsmen were highly regarded, whereas, in Chinese culture, craftwork has a lesser connotation of being something of a lower hierarchy. The Chinese aesthetics is mainly still driven not by craftsmanship but by cultural depth and literati or imperial direction. As a result, the Japanese craft market has a much more matured ecosystem of production, mass production, and distribution. In terms of consumer market currently, I believe that the Chinese market is actually doing better than the Japanese one. Currently not as many Japanese youths are purchasing Japanese traditional crafts anymore whereas the Chinese market is still expanding and just starting to purchase our own traditional craftworks. So it’s really just a matter of time that people appreciate the Chinese traditional crafts. You mentioned the Chinese aesthetics is driven by literatis, could you explain a bit more about that? The Chinese literati pursues this natural state of being, where the heaven/nature and the person are in a balanced relationship, and they are one (天人合一). So they do not actually pursue in isolation a lot of these details of crafts, and it is more of an extension of this great desire to be joint harmoniously with nature and to embrace nature in its full form. So a lot of the artworks and their aesthetics is driven towards this elusive concept of nature and self. As a result, the details become distractions to this effort of being completely overwhelmed and immersed in nature and natural state of being and pursuit. Perhaps because innately many literati longed to be hermits, and they couldn’t, so that desire is manifested in their tastes and aesthetics. Think about the Chinese’s gardens–it’s not to make it like a palace. If you visit a Suzhou garden, it’s full of deliberate plannings which seemed natural. When you look at a tree, you can see it differently in all angles, and one could possibly spend decades to plan and build a Chinese garden. It’s not to pursue this sense of opulence and glamour, but an expression of their pursuit for purity and nature. Nature is the key concept in Chinese aesthetics, not how we manipulate nature to our taste. Currently, perhaps as an influence by Japanese culture, many Chinese today would think that being intricate and details are the ultimate definition of high quality. A few years ago I was with some grand collector of antiques that have items which are of same quality or possibly even the same type of items as what the Palace Museum has, and they met up with some of the embroidery masters who commented that the antique embroidery pieces they had were not as intricate or “better” than these modern day craftsmen’s work. But that is a misconception because we’re not competing for who has better embroidery work here, because if that’s the case, the machine would win hands down in precision. The beauty of these works is more in the design, in the colour pairing, the composition, and all these taste have been lost to us. Many craftsmen are not able to create good original designs. The ancient people were not show-offs of skills. Things they created had to serve functional purposes, of course, they were also limited by their equipment in those days, so they weren’t really “art for art’s sake” in that they wanted to have embroideries as fine as hair, or porcelain pieces as thin as possible. They wanted to have a beautiful bowl that serves the function of a bowl and is sufficiently beautiful to bring joy to me at the same time–not just a bowl to be admired and not functional, or for investment purposes. Many today see art and craftworks as an investment–it’s about whether it’s of value, or if it has appreciation potential that’s why they buy it, instead of whether they really like it or not. Of course, the two aren’t mutually exclusive, but what I want to do is to make people feel that the item is beautiful and it brings joy to them by owning them. So the sense of aesthetics and taste is something that probably is very much formed in a person’s formative years, so how has your childhood influenced your taste as it is today? Actually, I did not grow up with all these antiques and artworks, but slowly as I got into it I became more interested and that influenced my taste today. Many people I know got into traditional art or culture when they are of a certain age, like yourself, Mengmeng, etc and became really good in them. So your taste and appreciation can be cultivated. In fact, if you were born into it, it might not be as good because your intention might not be pure as you rely on it for survival and are influenced by other considerations. How do you engage young people to work on your craftwork and items since youths are always on the phone these days? Having phones actually makes it really convenient for us to work today. Phones are just a tool, there’s nothing special about working in the craft industry because people are not on their phone all the time anyway when they do work in other professions. There is no worry about youths learning and making a living out of such traditional crafts as long as there is a demand, it’s just a matter of cost–it’ll just more expensive since young people charge higher than the seniors. Kesi/K’o-ssu is actually quite safe in its continuity because it could be made into a piece of painting and serve a decorative purpose like an artwork, whereas other crafts like Luo (silk weaving that looks like lace as in the fabric used in the two fans below), it couldn’t exist on itself as a decorative piece of work, and people would not be willing to pay for them, so that is a more endangered craft. Also, a machine could recreate that whereas Kesi/K’o-ssu currently couldn’t so all these are factors. People generally would still rather pay a few thousand or tens of thousands on mass-produced branded items, such as bags or shoes to say a traditional craft, so what do you think about that? Ultimately it boils down to what people think is of value. There are people who buy really cheap hanfus but that’s alright, because they need time to get familiarised with this type of art form, and over time, they might want to level up to get the better quality ones. Nobody will come into a new consumers’ item spending tens of thousands right away. So what I think is important is to create beautiful things, and hopefully, over time as more people get to know them, there is a small percentage who would find it meaningful and worthwhile to buy them. Also, the idea of what items do you associate with as representative of your identity and personal value. Some think that a branded bag would be a better projection of their social standing and importance, while others would think that a fan would be able to speak more about their cultural depth, so these are all different identities which one associates with oneself, and it ultimately boils down to which one prevails at the end of the day. Yes, we went on to talk about other things, and I find that Lijing is able to succeed because of his great clarity in his target market, their consumption habit, and no illusions about the reality of consumption which many craftsmen or artists might fall into. He is as much an artist as he is a businessman. I love his depth–it’s hard to find businessmen who can engage in such meaningful conversations about craft and history without sounding like they’re trying too hard. Of course, juicy things always come last–it’s to reward those who read thoroughly. Last year, Lijing was embroiled in a controversy with another kesi/k’o-ssu fan maker who was credited for the fans in Yanxi Palace. Naturally, the show was the talk of the town, and Lijing put out a public claim that they stole his design. The controversy erupted because many of his designs were based on artefacts, so anyone could technically copy those antique designs. But I also understand that for certain designs, he would combine the shape of the fan, the composition of the ancient painting and lay them out on the fan which would result in an original design (or not?). Now, I’m not an expert on intellectual property rights, but I do know that based on existing China IP laws, such claims are hardly recognised due to it being too generic. So it is unlikely that he has the legal claim to such. What is intriguing, however, was that he was exactly like Warhol in this instance. According to some discussions I found, the copyright of design of the shape of many fans that he sells belongs to this fan making company, while some of the kesi/k’o-ssu artworks were based on antiques/ancient paintings, and the weaves were done by the kesi/k’o-ssu craftsmen. However, just like Warhol, the concept and the marketing and the brand belongs to him, thereby changing the concept of an artist’s mark in Warhol’s case, and in his, the artisan’s mark. Artists or designers do not necessarily create things from scratch, photographers especially portrait ones also do not because it is highly dependant on the model, make-up, dresses, artistic direction and post-production. So in this world, these lines of trademarks and copyright are becoming extremely grey. It’s an interesting thing to observe in the Chinese market, as the Chinese become more aware of IP claims and rights, and we realise that we have stepped back into the Pop Art era in the US! And as they always say, you are nobody until people start talking about you (for better or worse) right! And in many ways, perhaps this is truly reflective of the ancient perception of gentleman art and consumption. One that is not based on craft but on taste and reputation. Epic. I know nothing of this craft, so this is very VERY interesting. I’m not terribly knowledgeable about US pop art considerations (or Warhol, frankly), but I see a certain Renaissance shape to your interviewee’s position. In, say, a painter’s studio in the Renaissance, any number of assistants and other artists might work on a painting throughout its production. An apprentice to mix paints, a journeyman to paint a bit of the actual canvas (and very likely sneak in a portrait of himself as an angel or whatnot), but the finished work was very much recognized as a single person’s composition. I prefer to use that language, actually, for that very reason: many artists, one composer. It’s too musical, perhaps, in terminology, but it suits my ideas of what went on and how these works came to be realized. Notably, the sort of patronage happening, and the leveraging of personalities to obtain that patronage, also saw the lines between Artist and Merchant (or perhaps Marketer or Networker; I’m not certain what word I want here) blurring. It’s always so exciting when a craft is recognized as art. They so often ARE art, but aren’t seen in that way. Also, as much as it doesn’t benefit me, personally, it’s refreshing to see someone who’s ready to admit that there’s a learning curve on appreciating such things, and that it’s better not to dilute them simply to suit the understanding of a wider market. There’s an integrity there I find quite appealing. Wow thanks for this sharing! He is indeed very much a Chinese Renaissance man! I thought his involvement with the celebrities and the fashion world was also interesting therefore the reference to Warhol! Yeap, just bought a fan from him for a friend, and you can tell that he puts a lot of thought into improving every fan he makes, so he got the fan that we wanted redesigned. So that’s a lot of pride there!